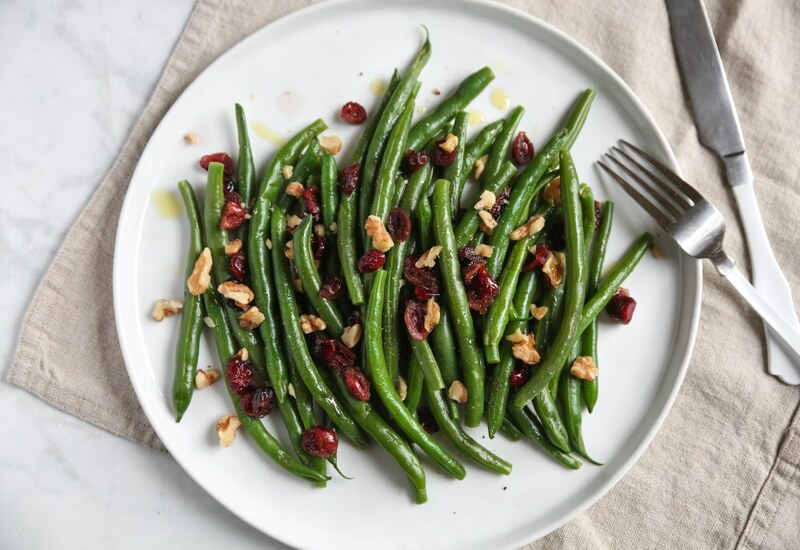 This quick and easy side dish brings green beans, cranberries, and walnuts together for a festive addition to the holiday dinner table. Toasting walnuts brings out their flavor and really enhances this dish. Walnuts can be toasted in one of two ways. On the stovetop in a single layer in a hot dry pan or in a 375 degree oven on a baking sheet. Either way, be sure to watch the walnuts carefully! They go from being toasted to burnt in a matter of moments. The moment they become fragrant you will know they are almost done. In a small container, add the cranberries and vinegar; stir well to coat the cranberries. Pour water into the pot of your pressure cooker. Place rack over the water and the steamer basket on the rack. Pile green beans into the steamer basket loosely. Close lid and set the valve to Sealing. Press Pressure Cook and adjust cooking time to 5 minutes at High Pressure. When cooking time is up, release pressure through the Quick Release valve. 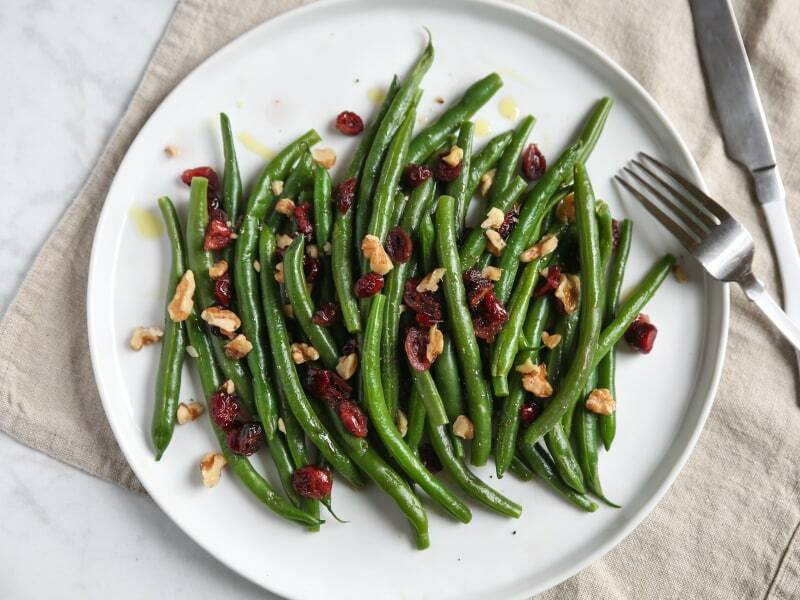 Tumble green beans into a salad bowl; top with the cranberry-vinegar mixture, walnuts, olive oil, and pepper. Lightly toss mixture to coat. Walnuts and cranberries are easy to get any time of year, but if green beans are out of season this recipe works just as well with frozen. Per Serving: 351 calories; 26g fat; 31.1g carbohydrates; 6g protein; 0mg cholesterol; 164mg sodium. Last-second side to use up some green beans that had sat in the refrigerator just a bit longer than I wanted them to. The cranberries and the walnuts really stole the show. Surprised the beans didn't completely wilt. Still had some snap to them. Great side dish for chicken, though I'm sure it would also makek a great Thanksgiving dish. Made this for Thanksgiving, but finally getting around to reviewing this. Served this for my friends and I - and we enjoyed this! The green beans were nice & crisp and the cranberries provided sweetness that balanced the dish very well. Will make this again for the Holidays. I made these green beans and they have a ton of flavor and great texture and crunch. They're really nice for the holidays or any other special occasion. I made them as a side to a traditional Sunday dinner with my family that came to town. Definitely will make these again! 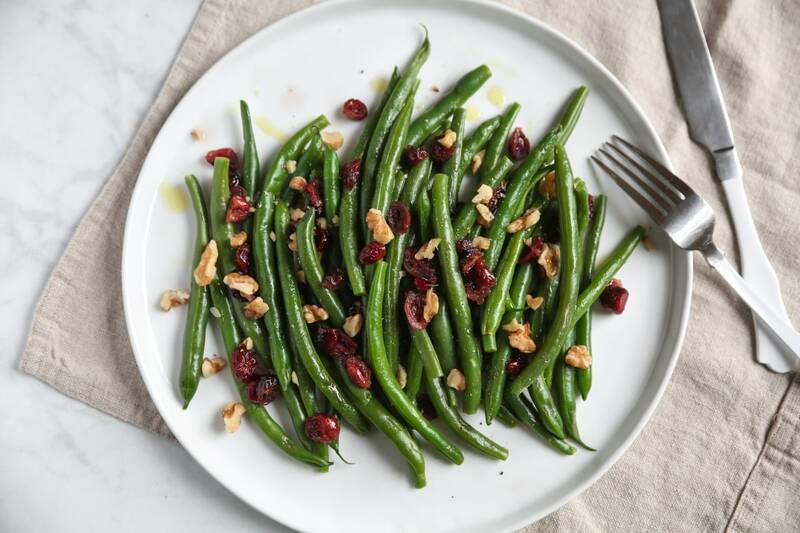 I usually make my green beans with slivered almonds, but I really enjoyed this version with walnuts and cranberries. It was very delicious, easy to make, and a lot of flavor. I plan to serve this up again for Christmas, as they were a big hit with my family. Left out the cranberries and walnuts and just made green beans with some sea salt. Good recipe and easy way to make veggies in the pressure cooker in mere minutes. Followed the recipe to the T and it was delicious! We prepare our lunches for the week and try to make them as good as a dinner would be, than eat less calories for dinner. With recipes like this, we look forward to lunch time. I made homemade applesauce found on this app and air fried boneless pork chops to go along with several vegetables. At the same time I did steam some snap peas, carrots, and broccoli to go along with the lunches.